Inspired by the natural health and energy properties of Manuka Honey, Manuka Sport Bee-Fit was created to offer the sporting community user-friendly formats for consuming Manuka Honey. Manuka Sport Bee-Fit is a new brand focused on delivering 100% all natural, great-tasting products. The energy gel has taken several years of development, testing, and field trials, to ensure it provides the highest quality of energy during exercise. The unique formulation combines the natural health and energy properties of Manuka Honey, with glucose and fructose to deliver the ultimate sustained carbohydrate boost. 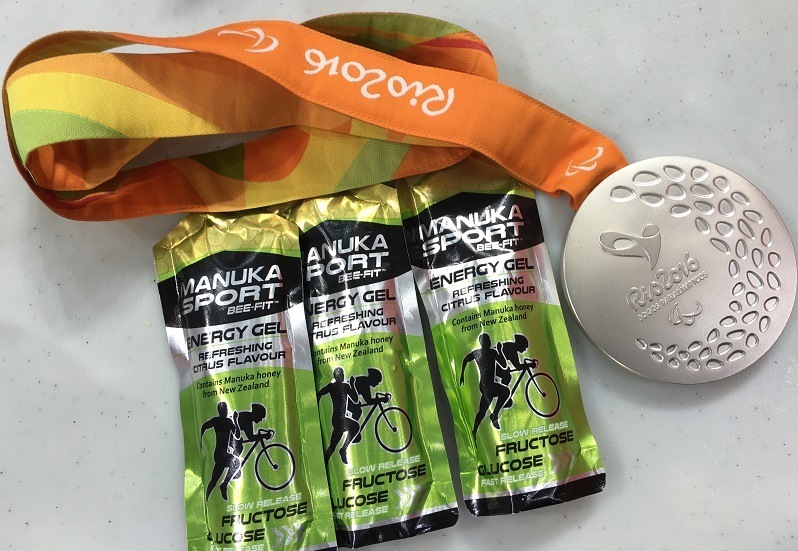 Newly launched Manuka Sport energy gel was used by Jozef Metelka at Rio 2016 Paralympics. Jozef won a Gold and Silver medal in the weekend of the 10th and 11th September at the Rio Velodrome. Manuka Sport is the only energy gel in the world that contains Manuka Honey from New Zealand. The unique all natural ingredients with added electrolytes helps fuel athletes to success. Manuka Sport is also WADA prohibited Substance batch tested so athletes can feel confident fuelling up with this energy gel. Compared to other gels on the market the lead ingredient is Manuka Honey. Manuka Honey is sourced from New Zealand and is a natural source of unprocessed sugar-fructose and -glucose that directly enters the blood and delivers a quick punch of energy. The Manuka Honey contains 80% carbohydrates, 18% water and 2% vitamins, minerals and amino acids.